University of Arizona Press, 9780816531554, 88pp. 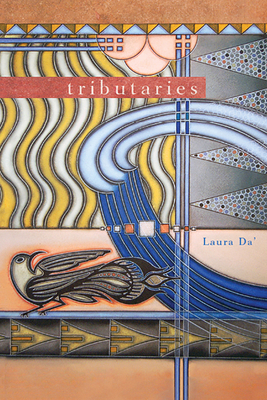 In Tributaries, poet Laura Da’ lyrically surveys Shawnee history alongside personal identity and memory. With the eye of a storyteller, Da’ creates an arc that flows from the personal to the historical and back again. In her first book-length collection, Da’ employs interwoven narratives and perspectives, examines cultural archetypes and historical documents, and weaves rich images to create a shifting vision of the past and present. Precise images open to piercing meditations of Shawnee history. In the present, a woman watches the approximation of a scalping at a theatrical presentation. Da’ writes, “Soak a toupee with cherry Kool-Aid and mineral oil. / Crack the egg onto the actor’s head. / Red matter will slide down the crown / and egg shell will mimic shards of skull.” This vivid image is paired with a description of the traditional removal path of her own Shawnee ancestors through small towns in Ohio. These poems range from the Midwestern landscapes of Ohio and Oklahoma to the Pacific Northwest, and the importance of place is apparent. Tributaries simultaneously offers us an extended narrative rumination on the impact of Indian policy and speaks to the contemporary experiences of parenthood and the role of education in passing knowledge from one generation to the next. This collection is composed of four sections that come together to create an important new telling of Shawnee past and present. Laura Da’ is a poet and public school teacher. A lifetime resident of the Pacific Northwest, Da’ is an enrolled member of the Eastern Shawnee Tribe of Oklahoma. Da’ lives near Seattle with her husband and son.